Over the past decade and change, Don Hertzfeldt has quietly, tirelessly asserted himself as America’s most insatiably imaginative animator. Ever since his breakout effort, 2000’s “Rejected,” earned him a Best Animated Short Film Oscar nomination, Hertzfeldt has been quietly producing breathtaking shorts. 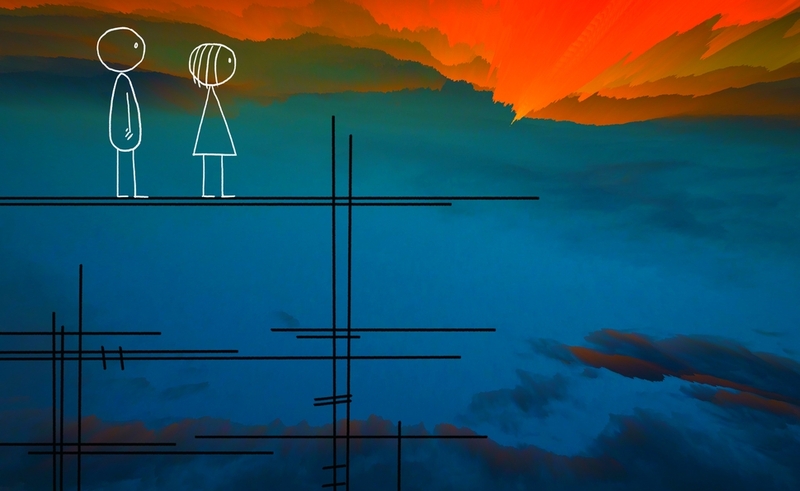 Three of those small wonders, all starring a profoundly human stick figure named Bill, form Hertzfeldt’s 62-minute “It’s Such A Beautiful Day,” which is currently amassing cult adoration via Netflix’s instant-streaming library. His newest film, the mind-expanding existentialist 17-minute thought experiment “World Of Tomorrow,” has methodically gathered ecstatic raves as it’s moved from festival to festival. Fresh off a win in the Animated Short category at South By Southwest, Hertzfeldt answered some questions via email. The Dissolve: “It’s Such A Beautiful Day” leaves a huge emotional impact. Do fans of your work ever share how Bill’s anxieties and melancholy resonated with them? The Dissolve: Your couch gag on The Simpsons was your highest-exposure project yet. Did it open more viewers up to your work? Hertzfeldt: Well, I guess it must be true in theory? I have no idea. They say something like 8.5 million people watched that season première, but I’m sure the vast majority of them probably just felt like they experienced a mild seizure for those opening two minutes, and then maybe forgot about it. I guess we’ll be testing the theory when we see how “World Of Tomorrow” performs online. This will be the first time I’m releasing a piece online, without the usual long theatrical run, DVD, etc. Whether it sinks or swims is really going to dictate whether I try something like it again. The Dissolve: “World Of Tomorrow” is your first film to use digital animation technology instead of analog methods. Did the story you wanted to tell compel you to explore new technologies? Hertzfeldt: I wanted to learn some digital animation here at home while getting ready for the next feature film. In almost 20 years of animation, I’d never even drawn anything on a tablet before. So I wanted to make something fast and furious to learn the ropes, and science fiction was the perfect playground for that. “Don finally makes something digital: the future!” Then The Simpsons got in touch only two weeks after I started “World Of Tomorrow.” The Simpsons piece needed to be digital as well, and it made sense to work on the two at the same time. The Dissolve: “World Of Tomorrow” embraces genre—in this case, science fiction—more directly than any of your earlier films. What about SF in particular attracted you? Should we expect forays into other genres in the future? Hertzfeldt: I’ve wanted to do science fiction for years. I’m actually surprised it took me this long. It’s my favorite genre, but I have trouble with genre sometimes, because it always seems to mean having to tread at least a little bit through overly familiar waters. It’s hard to make a horror movie that feels fresh and surprising after the audience has seen 10,000 of them before. So familiarity is going to haunt you in any genre—but “World Of Tomorrow” is so ridiculous, it’s more or less a parody. I’ve always loved the covers of old pulpy sci-fi novels and magazines from the 1950s and 1960s, those clean and modern designs: There’d often be a strong solid color, a bunch of mysterious geometric shapes, and then your main characters sort of running in the foreground. That’s pretty much where the Outernet in “World Of Tomorrow” got its look. I also wanted the film to look like a children’s book, very saturated and flat. I think you can also see some science-fiction thoughts starting to leak into the end of “It’s Such A Beautiful Day,” and after that, I did a graphic novel called The End Of The World, which was sort of like if science fiction had a really bad dream—and the book shares a few ideas with “World Of Tomorrow.” So it’s been a few years of this long sci-fi thread already. There might be a bit more coming. The Dissolve: You mine a surprising number of laughs from the subject of death in “World Of Tomorrow.” Do you find comfort in teasing out the humor from bleak situations? Hertzfeldt: I don’t know if it’s comforting, so much as it’s necessary for our mental survival. If we can’t laugh in the face of some horrible tragedy that is happening to us, there is really nothing left. For some reason, I’m kind of attracted to survival stories. I have shelves full of them. And even in the darkest situations, people in concentration camps, people starving on a glacier, whatever it is, you always find them retaining a sense of humor about it. The Dissolve: Care to hazard a guess as to what happens after we die? Hertzfeldt: Ha! Wow. Well… we’ve all been dead before, right? Until really recently, we’ve all been dead for the entire history of the universe. How mind-blowing is that? We’re already so incredibly, impossibly lucky to be even here at all. Every day is a giant cosmic miracle. Yet so many people want more: “There has to be something else, there has to be something afterward.” But don’t we already know what death is like? Isn’t death exactly like your memories of the year 1750? The Dissolve: One line in particular stuck out to me. Emily says, “I am very proud of my sadness, because it means I am more alive.” Could you speak to that? Is depression the cost of being really, truly alive? Hertzfeldt: No, depression is not the cost of being alive, any more than joy is the cost of being alive. Being alive means experiencing all these things. Life is the good and the bad and everything else. Sadness and depression, at the very least, are there to make us appreciate the happier times when they come around again. Having gone through any great sadness in a life seems to make people more interesting in general. They’re more grateful, more thoughtful. People who are weirdly happy all the time, like a little dog—don’t trust them. I’ve always liked that quote, “The more sadness is carved into your soul, the more joy you can contain.” [This is a paraphrase of a Kahlil Gibran quote from The Prophet. —ed.] Anyway, so Emily is figuring out her emotions and learning how to be more human, and for her, feeling sadness is better than feeling nothing. The Dissolve: “World Of Tomorrow” will have a full release On Demand, another first for you. Was this a deliberate choice? Have you had any frustrations or difficulties with distribution that led you to turn to On Demand? Hertzfeldt: No, no frustrations. I just want people so see it as soon as possible, and the fact that this one’s digital makes On Demand that much easier. With a 35mm movie, there’s a ton of lab work that has to be done to get the digital copy just right. So before, it made sense to parade the films through theaters for a longer time, where they looked better anyway, until the DVD or whatever was ready. “World Of Tomorrow” will be in theaters all year as well. It’s already headed to a couple hundred film festivals. The DCP looks beautiful, and we’ll send it to any cinema that wants it. But now that can happen more simultaneously. The Dissolve: For your next feature, “Antarctica,” you’re bringing on a team of additional animators for the first time. Has expanding your workforce let you do things that might be undoable solo? Hertzfeldt: Yes! Pretty much every single thing in “Antarctica,” aside from the script, I guess, would be completely undoable for me solo. The Dissolve: Could you single out a highlight moment for the “World Of Tomorrow” production process? Hertzfeldt: My niece, Winona, contributes the voice of little Emily. She was 4 when I recorded her. You can’t direct a 4-year-old, I learned that really fast. I couldn’t even get her to repeat lines for me. So I just recorded audio as we drew pictures together, played with stuff, talked about the world. I was pretty aware that if the recordings produced nothing, the film would have been dead before it even began. She lives in Scotland and I am in Austin, so I usually only get to see her about once a year. After a weeklong visit, recording five minutes here and there, I had about an hour or so of total recorded time with her. So the first step was finding all of her best reactions and questions, and I began to figure out what her character could be talking about here, or looking at there. And with that side of the conversation, I was then able to rewrite Julia’s opposite lines, and rewrite a bit of the story to make everything fit. So the highlight for me was seeing Emily animated for the first time with Winona’s voice coming out of her, and seamlessly interacting with Julia’s character. When you’re aware that it’s all coming out of very rough, lighting-in-a-bottle recordings, just whatever was in her head at the time, it’s really kind of a weird magic to see onscreen.